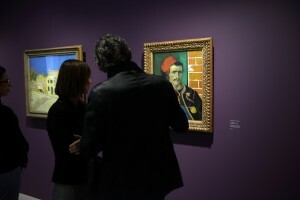 The Fondation offers guided tours of its exhibitions. All group visits must be booked via our booking office at least 15 days in advance. Self-guided tours are not admitted. The booking office is open Monday to Friday : 10am-12.30 & 1.30-4.30pm. > Free entry for the bus driver. Tour prices include booking fee. Guided tours are proposed in French, English and Italian. Groups may be accompanied by their interpreter. Groups must arrive 15 minutes before the start of the tour at the meeting place indicated on the booking confirmation. A cloakroom is available in the entry hall. However, the space is limited and we highly recommend our visitors to come without big bags. Small handbags are allowed inside the exhibition space. Backpacks are authorized if worn in front. In case of rainy weather, all outwear must be left in the cloakroom.